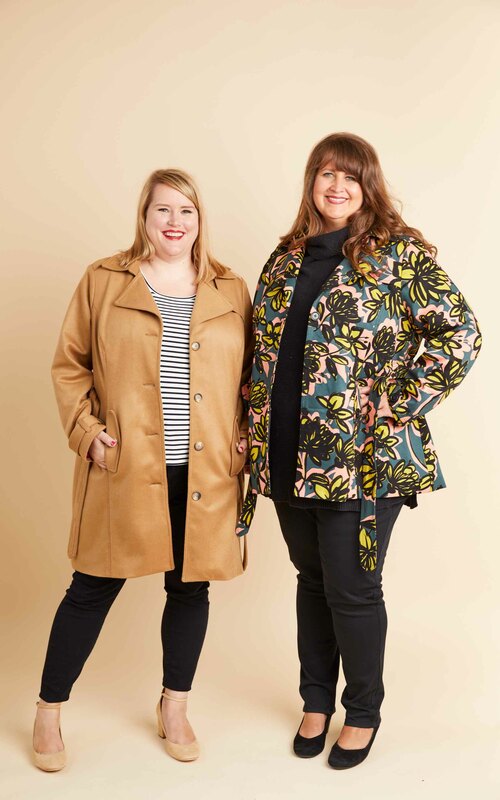 As we head into autumn up north, and spring down south, I’m thrilled to announce the launch of the first ever outerwear pattern from Cashmerette: the Chilton Trench Coat, a curvy and plus size coat sewing pattern! 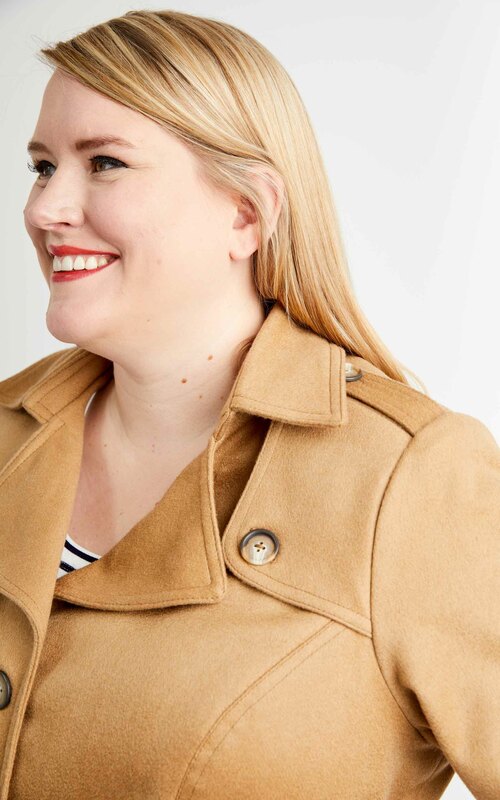 We believe that curvy women deserve classic coat tailoring without short-cuts, so we designed the Chilton Trench Coat with a curve-friendly single-breasted style, and ALL the bells and whistles. 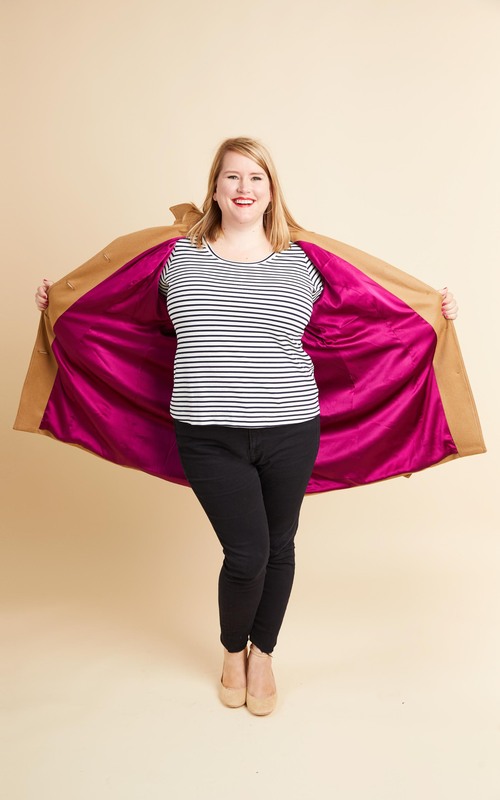 Make it from cotton gabardine, waterproof specialist fabric, or even dreamy cashmere (like the than one I’m wearing) and you’ve got your new staple coat, that’ll make you feel confident every time you stride out of the house. 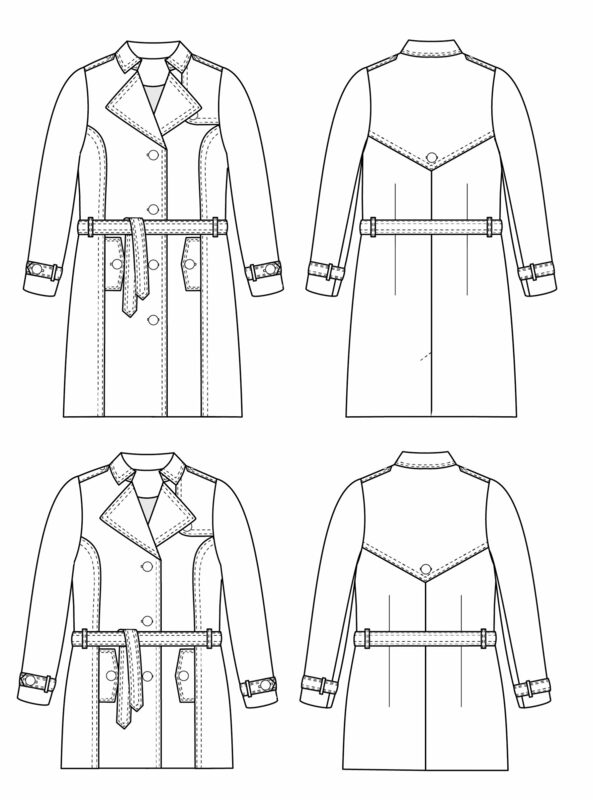 There are two views of the Chilton Trench Coat : View A hits a smidge above the knee and has a kick pleat, and View B is shorter, ending at the upper thigh. And of course, if you want, you can leave off some of the extras to make a sleeker coat. 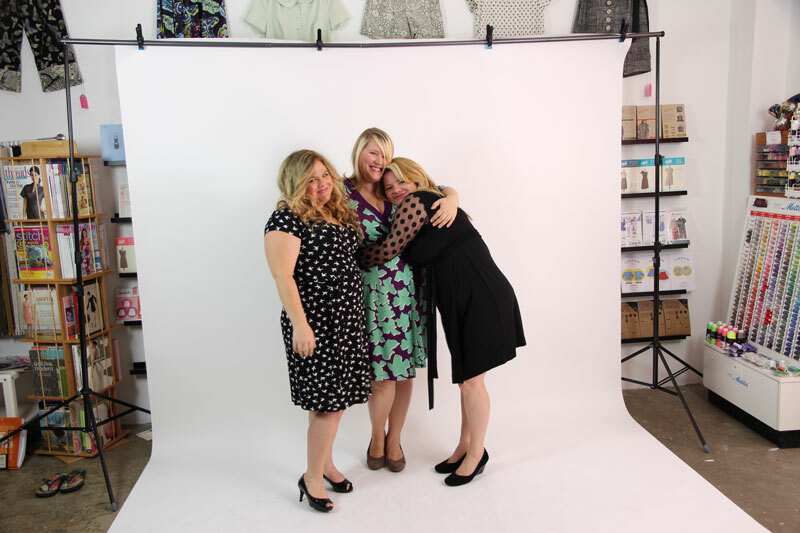 When you’re looking at outer fabrics, you’ll want a mid- to heavy-weight woven, depending on the kind of climate you live in and the season you’re making it for. Want a transitional weight, suitable for a slight chill and light rain? A heavy cotton with a twill weave would be excellent, or a waterproof raincoat fabric. 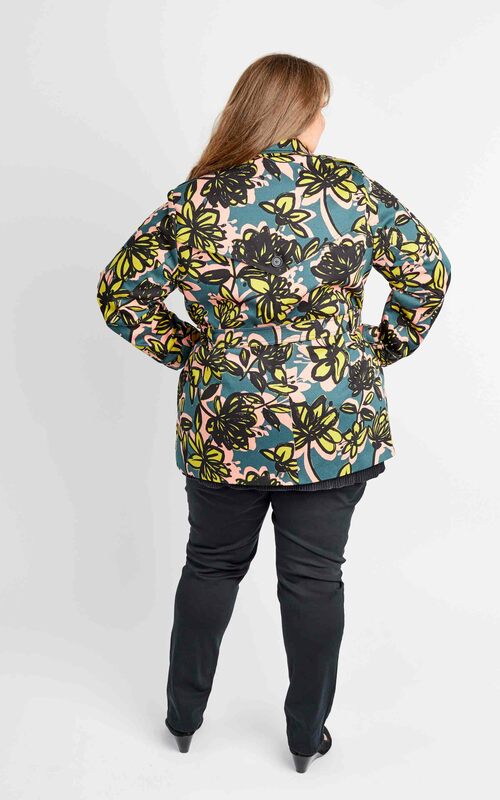 The version (of View B) that Donna is wearing below is a heavy cotton pique with a fabulous print which proves that trenches don’t have to be boring! Want your Chilton Trench Coat to last you through the winter? A heavier fabric (plus a warmer lining) will give you want you want – just note that if you’re using wool, we’d recommend a medium weight, or making all the accoutrements can become a bit tricky if they’re too bulky. The tan version I’m wearing is made from luxurious cashmere! For the lining, look at light- to mid-weight wovens, like silk crepe de chine or polyester. You can also use specialist linings like Kasha satin, or other types of flannel-backed fabrics which will give you extra warmth. Just remember that it helps to have a slightly slippery fabric to be able to get the coat on and off, and keep it from sticking to your clothes. If you really fall in love with a non-slippery lining (you rebel!) then I’d recommend still using a co-ordinating slinky fabric for the sleeves, because that’s where it’s most critical. 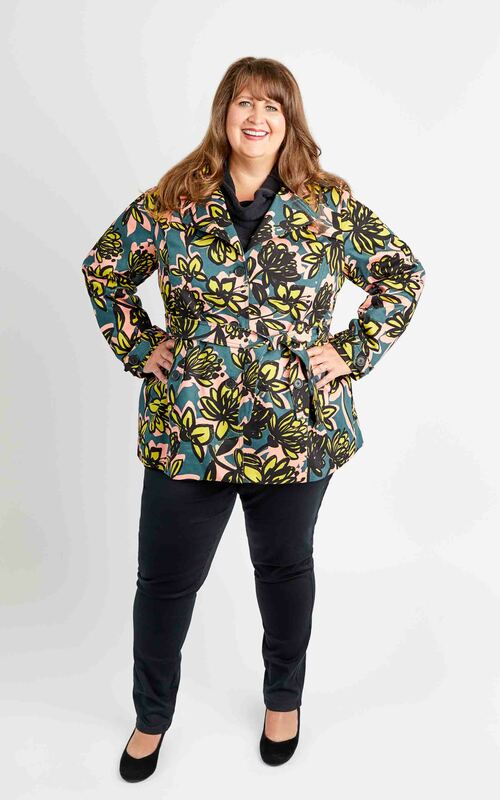 The Chilton Trench Coat curvy & plus size coat sewing pattern comes as a beautifully printed pattern which ships anywhere in the world, or as a downloadable layered PDF pattern (with Print at Home, US Copyshop and A0 options). Just pick which one you want from the dropdown menu. 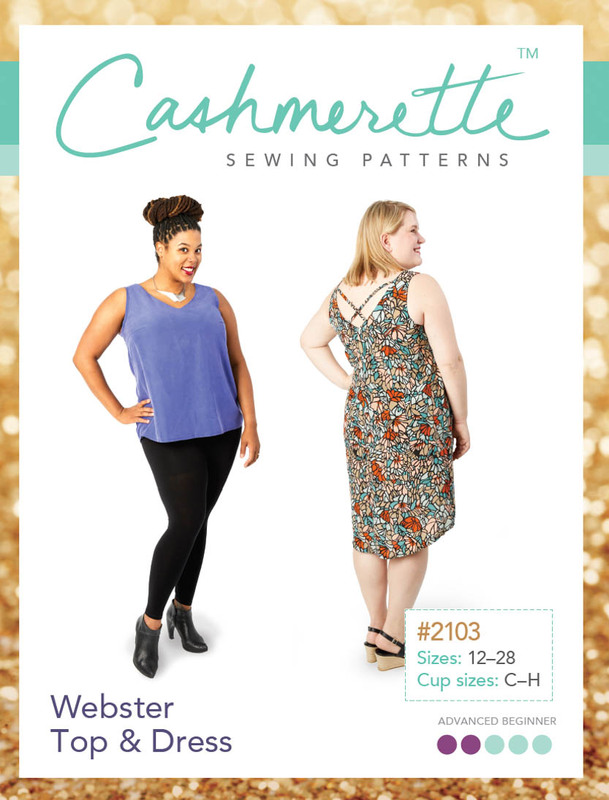 And, like all Cashmerette Patterns, the pattern comes in sizes 12 – 28, and cup size C – H.
The pattern is rated as “intermediate” because coat-making is slightly more complex than the average garment – but really, that’s because it has a lot of steps rather than any very difficult techniques, so if you’re an enthusiastic beginner you should totally give it a go! In fact, if you leave off the various extra bits-and-bobs (like the epaulettes and cape shield) it’s a fantastic first lined coat project. 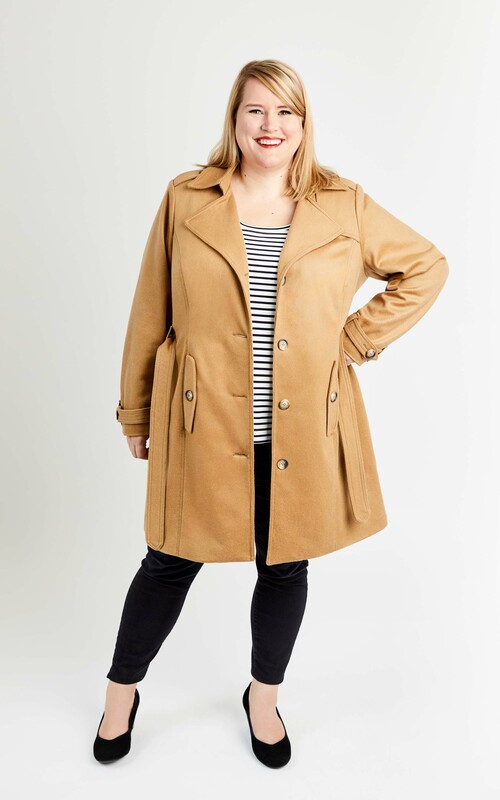 This has been a true labor of love, but coat-making is perhaps my most favourite type of sewing, so I hope can encourage more of you to join my coat gang! I’ve already ordered a fabulous large-scale floral sateen to make a really funky Chilton, and I cannot WAIT to see what you all make – remember to tag your makes on social media with #ChiltonTrenchCoat so I can admire your fabulous trenches. 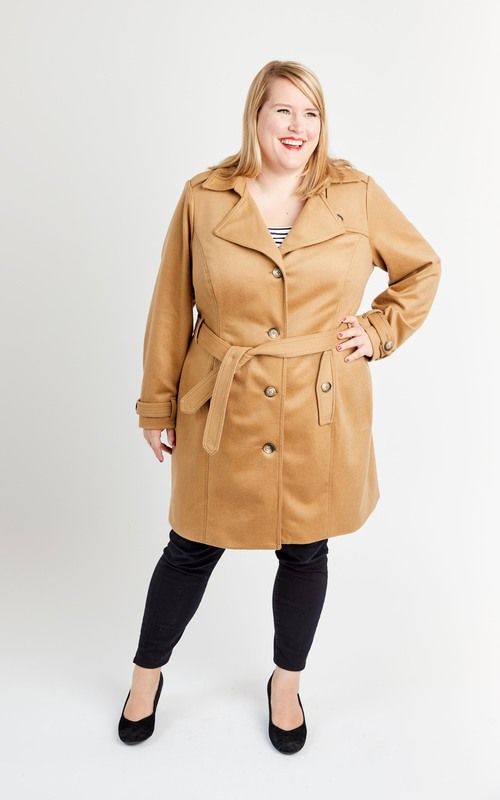 Beautiful coat and you look stunning in it, , where did you get your gorgeous wool fabrics from? i like the idea of wareproof backed wool, would that be teflon coated? The tan cashmere is from Metro Textiles in NYC, and the water-proofed back fabric was from Loro Piana, stocked by Emma One Sock a few years ago. I’m not sure what the backing is, but it’s like a very thin breathable rubber. Hi, lovely pattern!! I noticed that the fabric requirements is the same for both views, wouldn’t the jacket version take a little less fabric? Because of the various pattern pieces, and the way they’re laid out, it actually doesn’t end up needing less fabric (it’s a very marginal difference). I love this SO much!! All of the versions are so stunning, I bet it will look wonderful made up! I want to try as my first coat. Looks like I will have to wait, maybe November. The fabric will be an unusual color, maybe a print, and full-length. 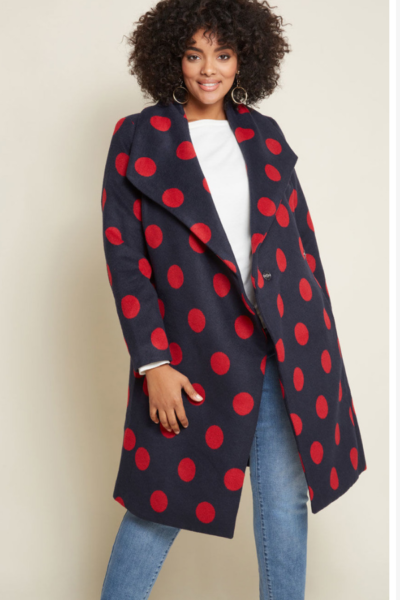 I was reading this after seeing the coat featured in a magazine, thinking “Yeah, nice but…” then I saw the super bright pink lining and WOW!!! I’m in love. In fact I just loved that surprise photo so much I might print it out so I can look at it every day and dream of a future where the kids can be left to prepare their own dinner and I can make myself a coat with a bright pink surprise lining. Love love love!